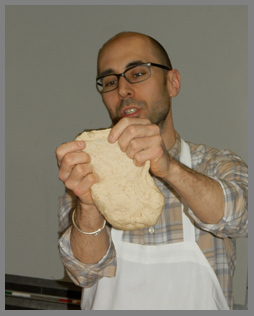 Ever since I took a bread making class with Chef/Baker Mark Fiorentino during The New York Culinary Experience 2012, I have been hooked on learning the art of bread making and crafting my own bread. 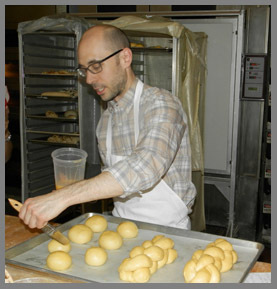 As part of The New York Culinary Experience 2013, I took another bread class entitled, "Baking Brioche" with Baker Peter Endriss, baker and co-owner of Runner & Stone Bakery and Restaurant in Gowanus, Brooklyn, New York, which opened in December 2012. Taking a class with Baker Endriss not only helped expand my knowledge and bread making skills; I also had the opportunity to get to know more about him as a bread baker, and as a person. He has an impressive background; he was a civil engineer before he made his foray into the culinary world in 2000. 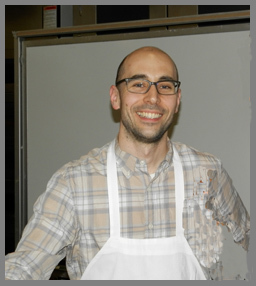 He honed his culinary and pastry skills working with such illustrious chefs as Patricia Yeo, Nicole Plue, and François Payard, before discovering the enticing world of bread making at Amy's Bread. He continued to develop his bread making skills during a stage in Germany in his father's hometown, which earned him a coveted position as the head baker at the renowned Per Se restaurant and Bouchon Bakery in New York, followed by a stint in Paris at the bakery L'Etoile du Berger, and lived in Italy before returning to the Unites States. This man definitely knows his bread. 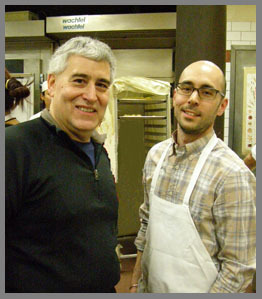 In December 2012, Peter and co-owner Chris Pizzulli opened Runner & Stone Bakery and Restaurant. 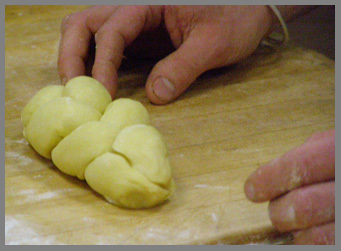 During the 3 hour and 15 minute class, Baker Endriss not only instructed the class in the basics of bread making, but also taught us techniques to achieve professional results by shaping, braiding, and forming the dough to create rolls and bread. The best part was we were able to take our work home with us, of course in bags and boxes for future enjoyment. 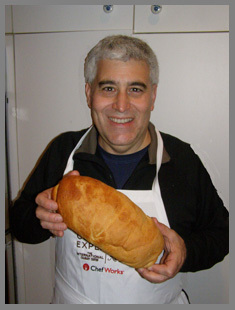 Baker Peter Endriss graciously shares his recipes for Brioche and Pain Au Lait, both of which I am happy to say that I continue to make at home. In fact, Brioche is one of my wife's favorite breads, so the opportunity to work with a new recipe was exciting. Method: Mix everything but the butter together and knead for 7 minutes to make a strong dough. Add the butter and mix until incorporated. Chef passed a tip that once we added the butter that a great method of ensuring that the butter would be fully melded into the dough was to take the dough and slap it down hard onto the counter. Once everyone got the hang of it, the sound of 12 students slapping their dough down was not only fun, but I enjoyed the "bread making music," and it really works. The next step is to let the dough ferment for 60 minutes, fold, and then place it in the refrigerator for 5 to 20 hours covered; this is a great recipe to make the day before. Preheat oven to 375° F (190.5° C). Take the dough out of the refrigerator one hour before processing to allow it to come to room temperature. Divide, shape, and let rise, covered, in the final shape for another 90 minutes to 2 hours. Glaze it with an egg wash and bake in an oven preheated to 375° degrees Fahrenheit for 15-30 minutes, depending on the shape and size. Method: Mix everything together, and knead for 7 minutes to make medium-strong dough. Let the dough ferment for about 30 minutes, fold, and then let it rest for another 30-45 minutes. Divide, shape, and leave to proof for about 30-45 minutes, covered. Glaze it with an egg wash (or not) and bake it in an oven preheated to 375° F (190.5° C) for 15-30 minutes, depending on the shape and size. This is a versatile dough that can be braided for a decorative presentation, or can be rolled flat and then add in different ingredients of your choice (i.e. cinnamon and sugar, chocolate, nuts, raisins, etc.). Read about The New York Culinary Experience in the Gastronomy section and interviews and recipes from the other classes in the Chefs' Recipes section. For information on attending the New York Culinary Experience 2014, please visit the New York magazine website: www.NYmag.com/nyce. For information on taking classes throughout the year with the excellent chef instructors at The International Culinary Center at their New York, California, or Italian Campuses, please visit the website: www.InternationalCulinaryCenter.com. Runner & Stone Bakery and Restaurant is open Monday through Thursday from 7:30 am until 10:00 pm, Friday from 7:30 am until 11:00 pm, Saturday from 8:00 am until 11:00 pm, Monday through Saturday for Apertivo from 4:00 pm until 6:00 pm, Dinner starts at 5:00 pm, Sunday from 9:00 am until 9:00 pm, Sunday Brunch is served from 11:00 am until 3:00 pm, and Sunday Dinner is served from 4:00 pm until 9:00 pm.